Last week, I turned another year older. So I thought, what better time than now to step up my anti-aging routine? I broke open a bottle of Avon Anew Genics Gen-Protect SPF 15 Treatment, part of the brand’s premium anti-aging line (and included in this month’s lineup of skin-saving Glamourbox beauty finds!). It promised to help reduce the look of key signs of aging: wrinkles, age spots, and discolorations – and I wanted to see if it would deliver. In your 30s, skin aging is definitely a concern. But thankfully, I’m still at that stage where the appearance of wrinkles is something I’m trying to prevent rather than erase. Think of it as a long-term investment – put in the work now and hope that it will pay off in the long run. Since I can’t visibly see the results just yet, maybe I’ll be thankful I started early years from now, when I’m older and decide I can skip the botox and plastic surgery… well, that’s the idea, at least! The box simply instructed that you should smooth it on your face and neck after cleansing every morning – and that’s exactly what I did. Every day for a week, I’d wash my face and apply it, even if I didn’t have plans of leaving the house immediately. At first, I couldn’t decide whether it was a sunscreen or a serum; the packaging reminded me of a serum, which is usually the first thing I apply right after washing. But because it had SPF 15, at least I didn’t need a separate sunscreen since it was already built-in. This helped streamline my morning beauty routine considerably, which, for me, consists of about six steps (as in: facial wash, serum, eye cream, sun block, pore minimizer, BB cream… you get the idea). So I was glad that this nifty little formula reduced my daily prep time by a few minutes. I also loved how lightweight it was and that it absorbed so easily—none of that nasty, white ghost-face effect you get with other heavier sunblocks. 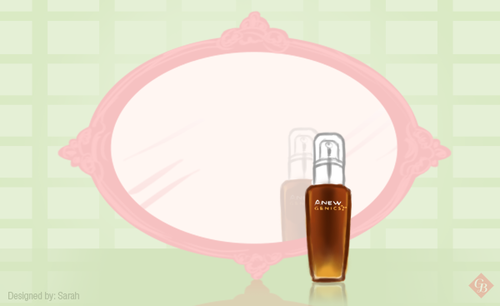 As for whether or not it worked—I did feel like my complexion looked fresher and brighter, but younger? Maybe it’s too early to tell. Though I’m thinking my 40-year-old self will hopefully be thanking me one day. Have you started an anti-aging routine? What are your favorite products, so far?